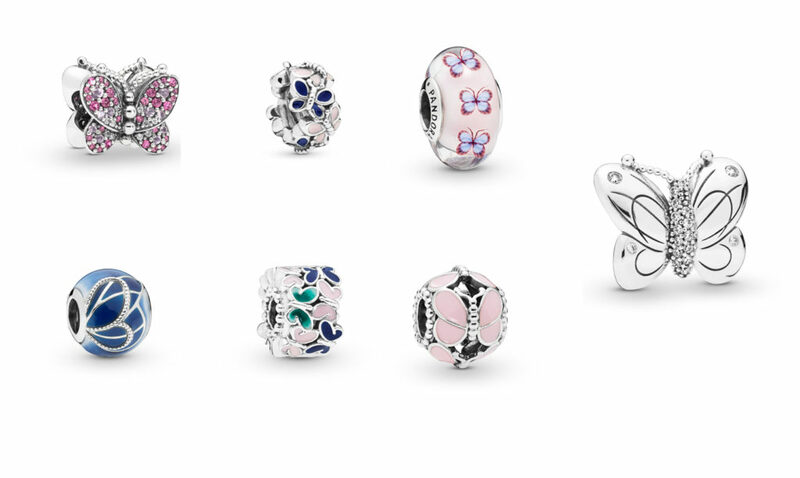 Blossoms and butterflies, bright blues and romantic rose hues- the Pandora Garden collection is here! The spring collection always evokes the sunny days to come with its whimsical nature-related pieces. This year’s spring collection has four main themes- Wings to Fly, Lucky Styles, Matte Brilliance, and Blossoming Styles. There are also a few new Disney pieces that were released! 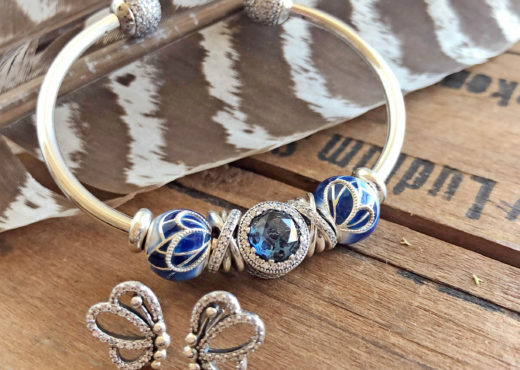 Read on for our full review of the Pandora Garden charms and jewelry. One of the main themes of this year’s spring collection is butterflies. All jewelry categories got some beautiful new winged editions- some a literal take on the butterfly image and others, like the Butterfly Wing charm, an abstract use of the butterfly outline. 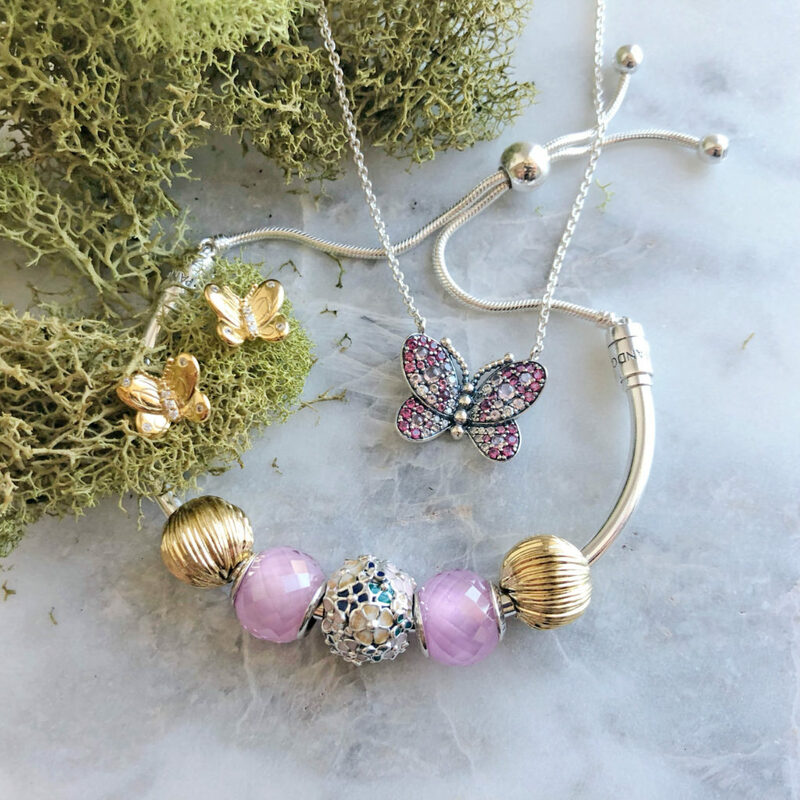 We love the use of enamel in this year’s butterfly-themed pieces. Not only do we have the usual soft pinks and vibrant blues- there are some new pieces that mix in emerald greens and marigold yellows in a fun new way! 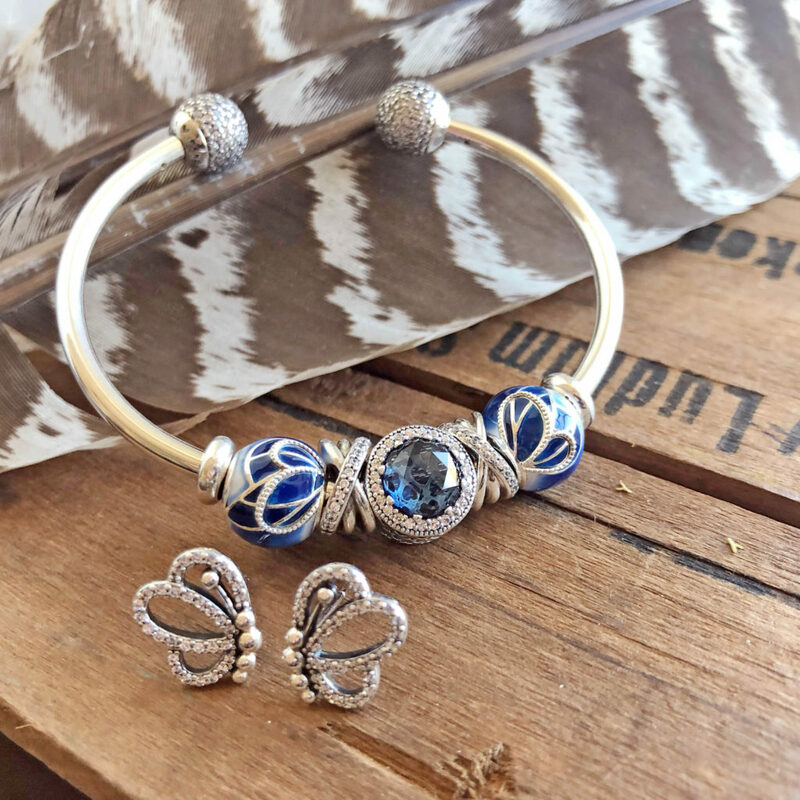 The new Decorative Butterfly statement charm ($80) surrounded by Butterfly Wing charms on the open bangle. We think the new Decorative Butterfly statement charm makes a great centerpiece to a spring themed bracelet. We also love the way the spring pinks and cobalt blue colors are complemented by the bright gold of Pandora Shine! You can’t have a magical garden without flowers! 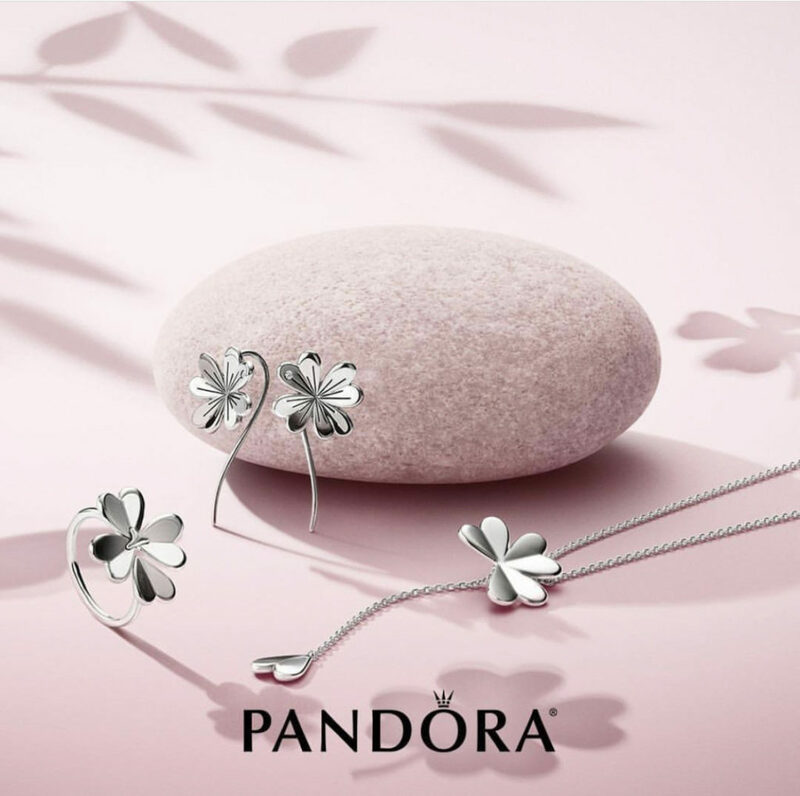 The Blossom portion of the Pandora Garden collection features both bright enamel flowers and classic monotone silver styles. We love the Blue Sparkle Flower charm with its soft blue tones. It goes really well with last year’s Blue Enchanted Pavé charm. 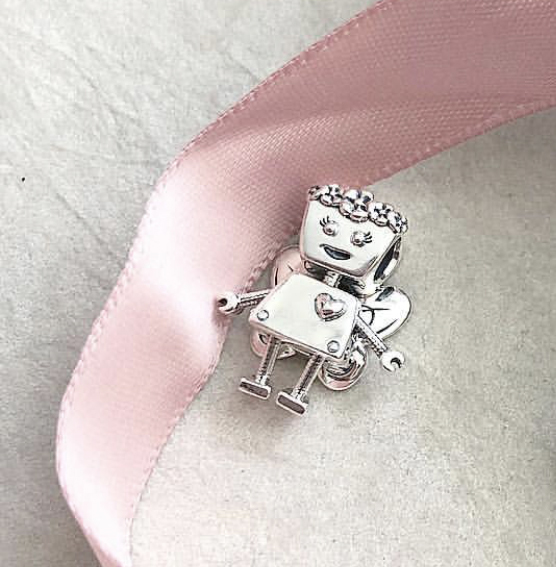 There is even a new Limited Edition Bella Bot- Floral Bella Bot! She is so charming with her flower crown and moveable butterfly wings! 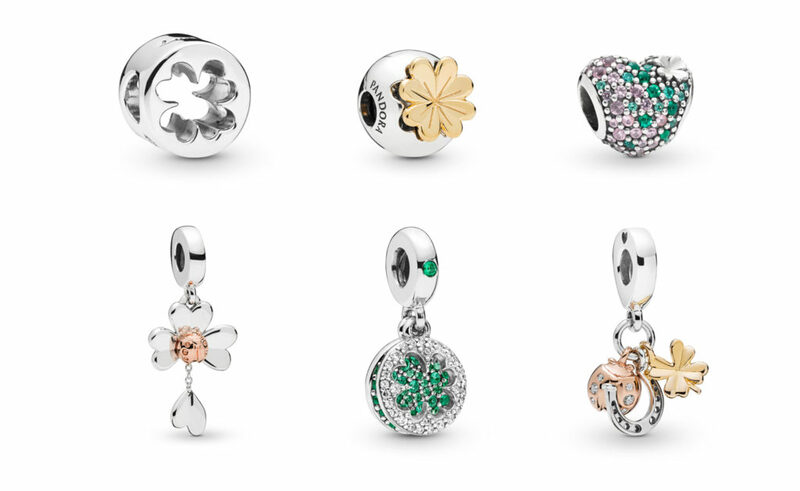 The last theme in the Pandora Garden silver charms is Lucky Styles, featuring the Four-Leaf clover- all grown up! 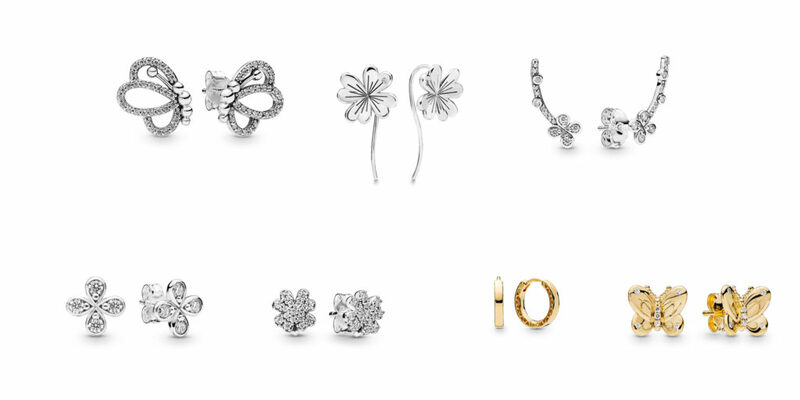 The majority of this part of the collections centers around a beautiful bright silver oversized clover. 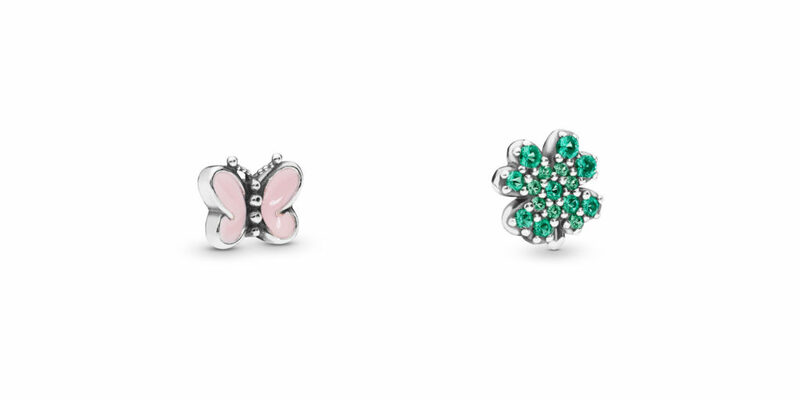 There are also some more colorful charms that mix emerald greens and light pink for a dazzling effect. We love the adjustability of the Lucky Four Leaf Clover Y-Style necklace- pull on the bottom leaf to change the length of the bottom chain! 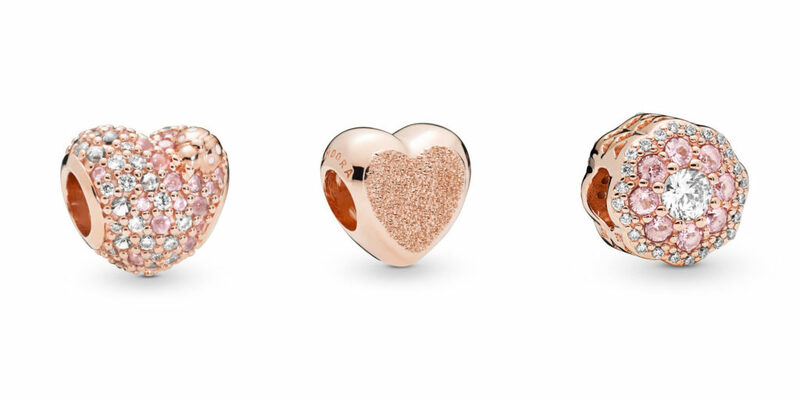 There are only a few Pandora Rose charm editions this season (but a lot of beautiful jewelry!). 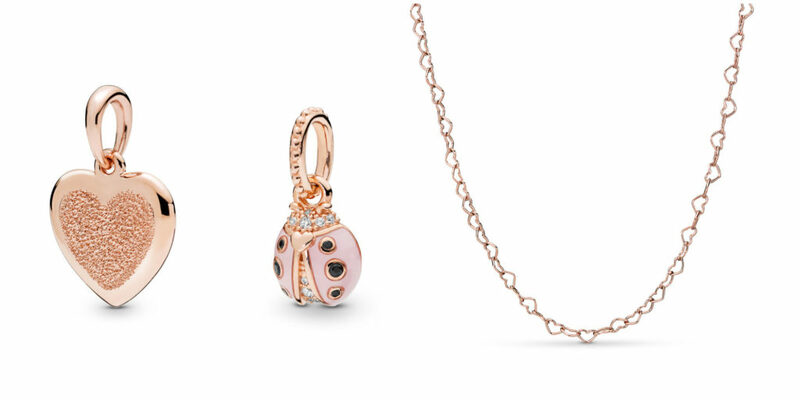 The all-Pandora Rose charms include the Rose Gleaming Ladybird Heart charm ($100), Matte Brilliance Heart Charm ($55), and Pink Sparkle Flower charm ($115). Have any travels planned for this spring? 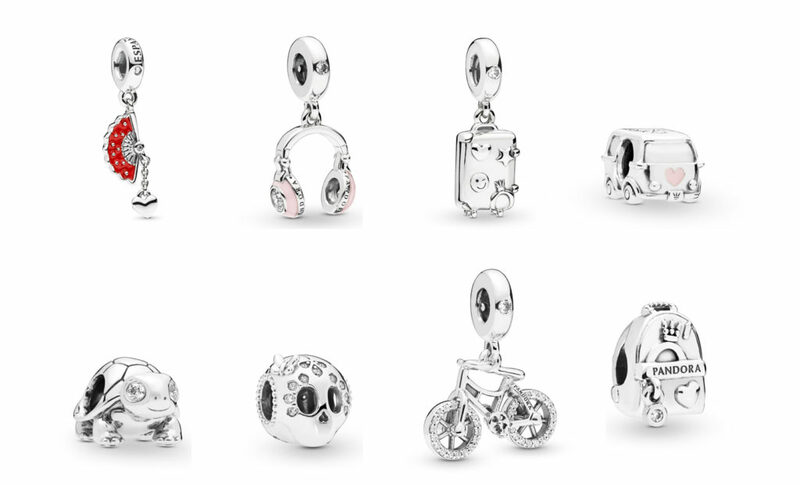 Pandora has a new mini-collection of travel charms! 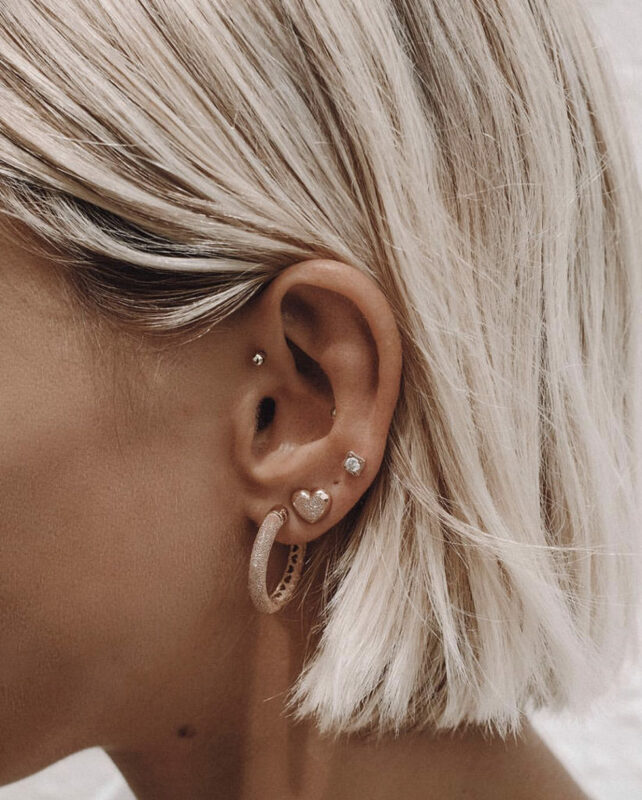 Celebrate your wanderlust with these fun new pieces. Whether you are backpacking through Europe, setting out on a road trip in your camper van, or just packing your bag for a weekend trip, there is something new for you! 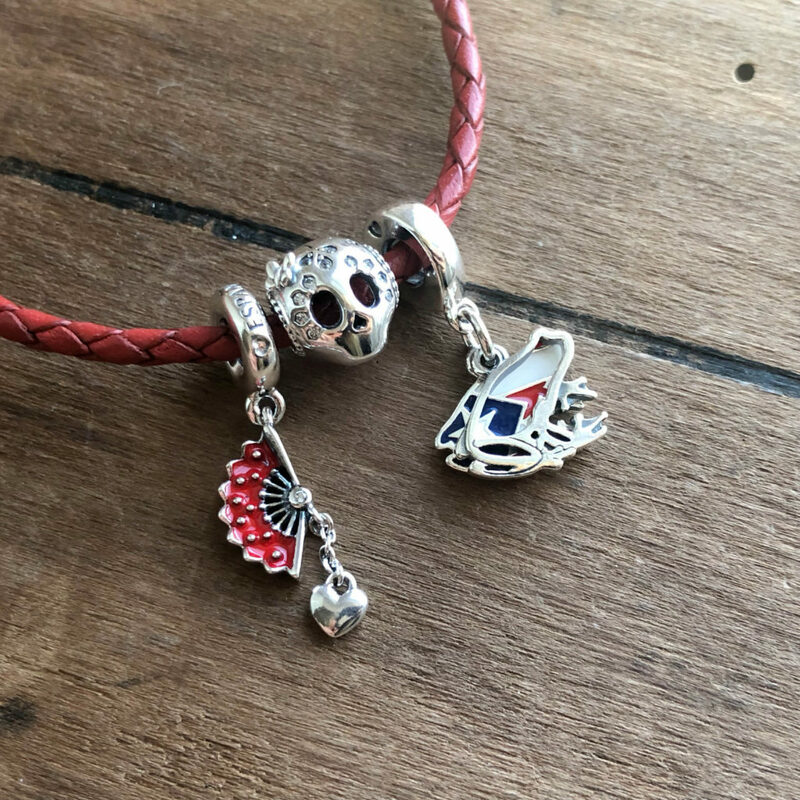 We love this trio of charms celebrating Latin destinations. The bright red enamel on the Spanish fan is so striking in person! The Pandora Garden collection includes a lot of fun new earrings, necklaces, and rings- and a new bracelet design! The new bracelet uses the sliding closure with a hard bangle bracelet. This is a great style for those who like the more natural shape of the oval open bangle but worry about not having a safety closure. 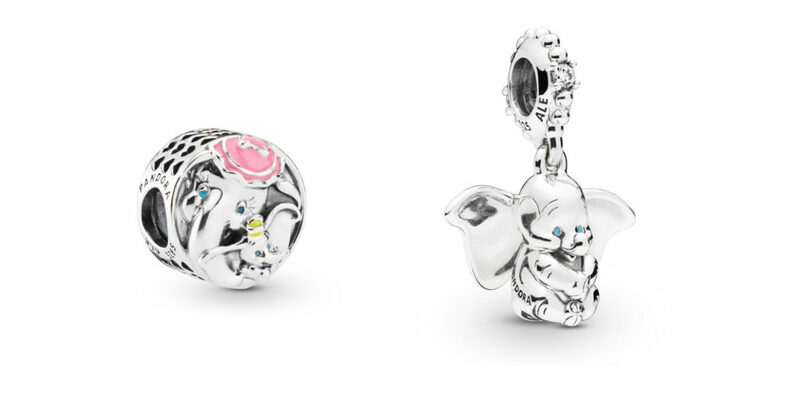 The earrings, rings, and necklaces all follow closely with the Pandora Garden themes of butterflies, blossoms, and lucky clovers. We love the four-petal blossom styles as a new classic look with a spring twist. Not overly flowery, they pack a good amount of sparkle in a small stud! Most of the new necklaces keep with the Pandora Garden theme, but there is one notable addition that stands on its own. The Joined Hearts chain necklace has a statement heart link. 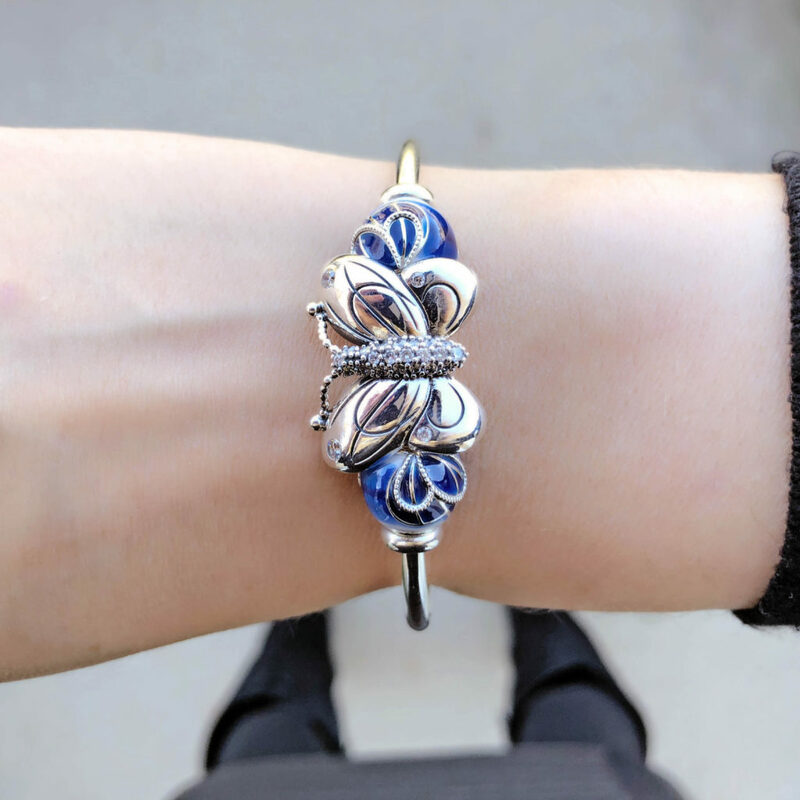 At 24″ length, it is a great chain to create a layered look with your other Pandora pieces! 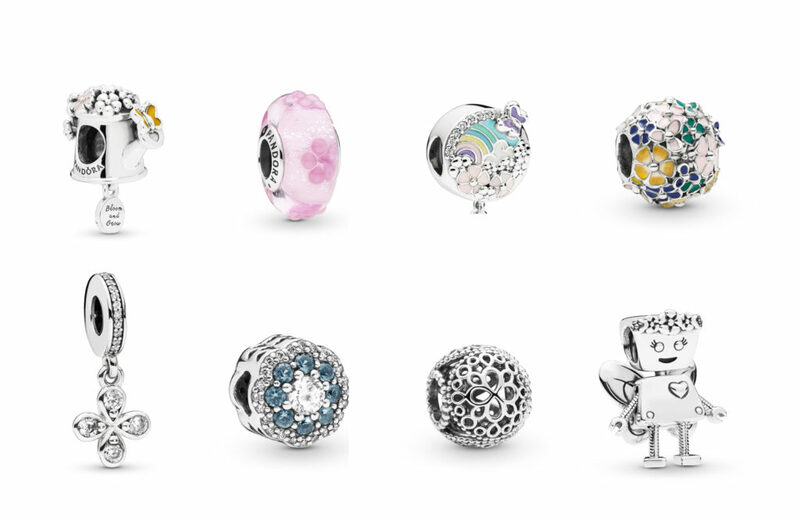 New Pandora Petite charms for the Floating Lockets have also been released with the spring collection. We love the sparkling green clover! 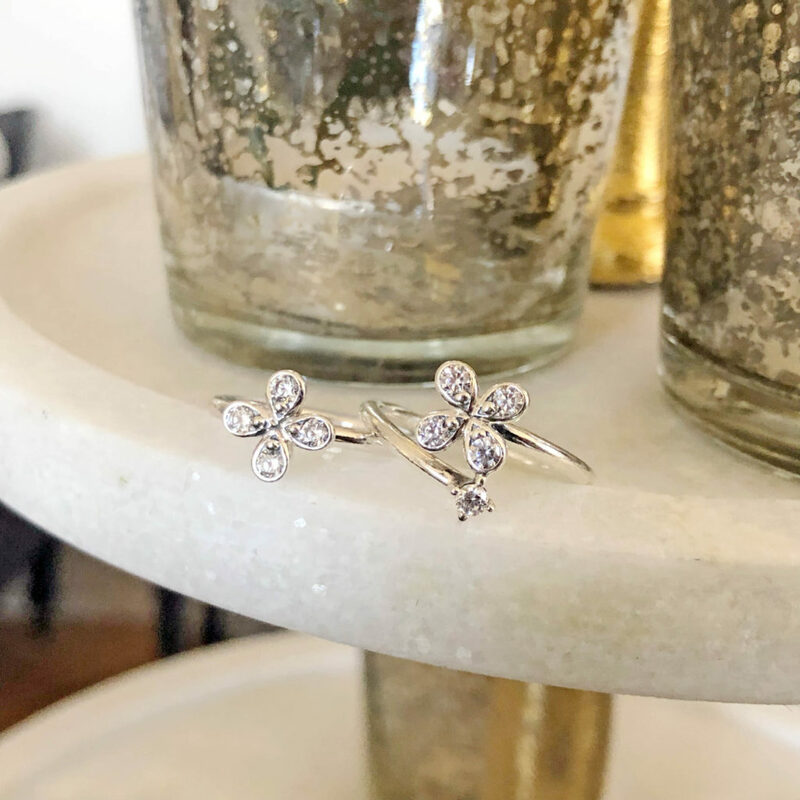 The new ring additions include classic pieces, like the Four-Petal flower rings, and sparkling garden statements, like the Bedazzling Butterflies ring. 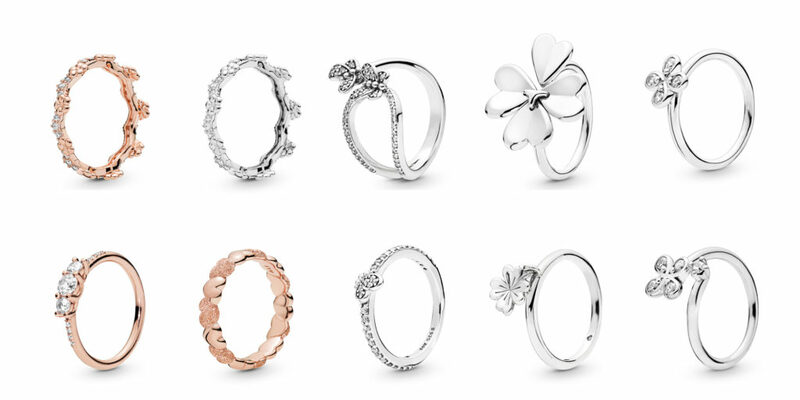 The new stackable Flower Crown ring is a great addition to the Enchanted Crown collection. Like the Enchanted Crown, the Flower Crown rings can be stack back-to-back or intertwined for a two-tone look. One of our favorite rings this season is the Sparkling Elegance ring released in the Pandora Rose finish- it is so elegant! 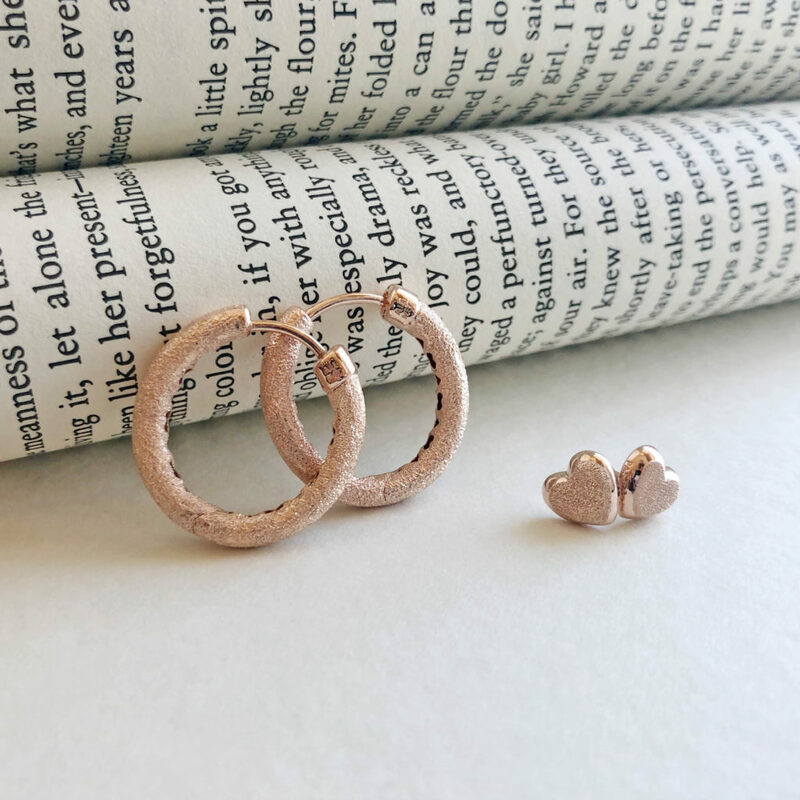 We love rose gold tones for spring- they are so soft and romantic! 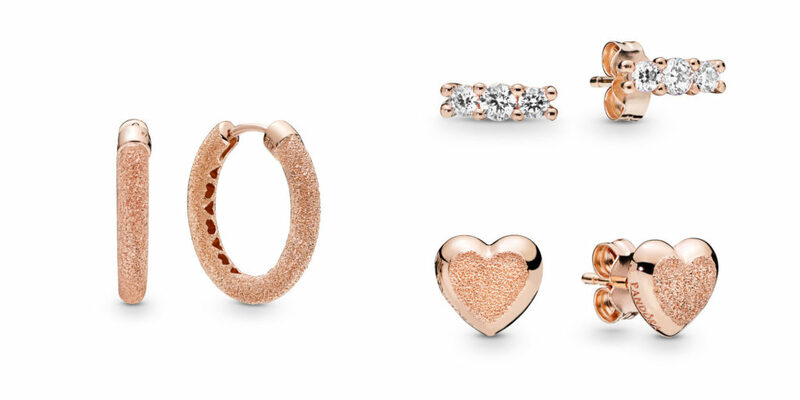 Luckily, there are some gorgeous new jewelry releases in the Pandora Rose finish. Some of the new Pandora Rose spring pieces are a reimagining of popular silver styles in the Rose finish. 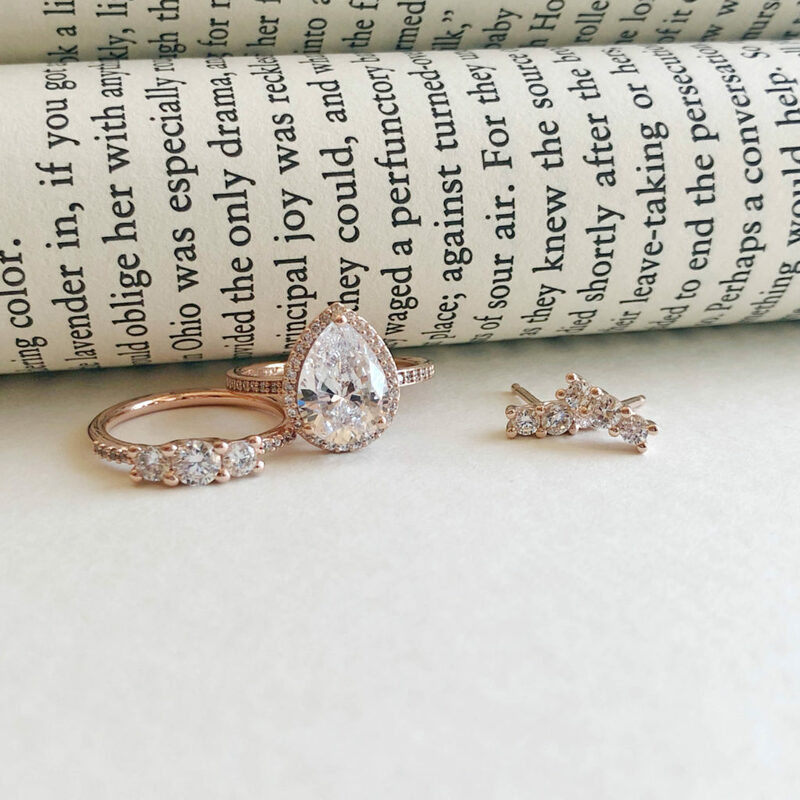 The Sparkling Elegance ring and earrings have both been released in Pandora Rose. 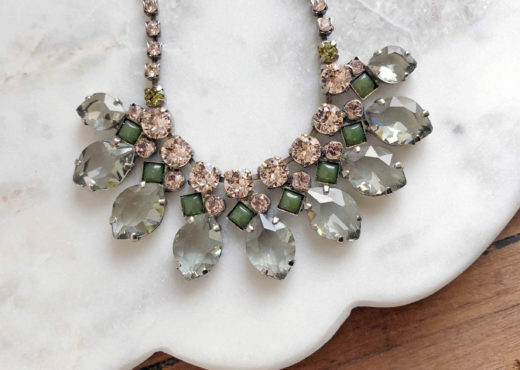 We love the simple sparkle of these pieces- they would make great prom accessories! The majority of the Pandora Rose pieces that were released for spring show off a new finish- Matte Brilliance. Using a velvety new texture, Matte Brilliance tones down the shine of Pandora Rose and brings out the color. 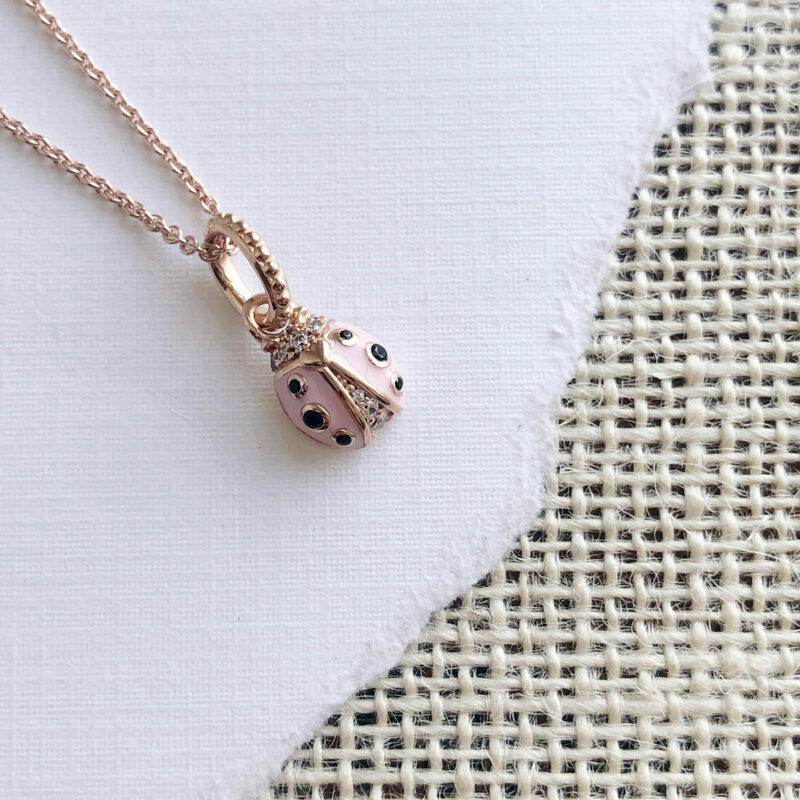 One of our absolute favorite pieces in the Pandora Garden collection is the Pandora Rose Ladybird pendant. We love the soft pink against the Pandora Rose and the touch of sparkle underneath the wings. This lucky ladybird is ready to fly home with us! Necklace additions in the Pandora Rose also include a Matte Brilliance Heart pendant and the Joined Hearts chain in the Pandora Rose finish. 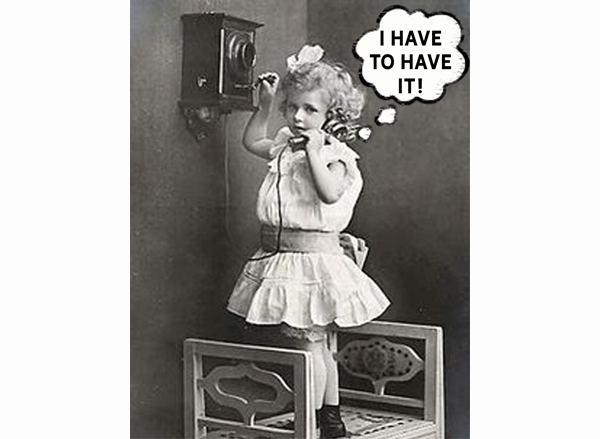 We hope you enjoyed our review of the new spring collection! 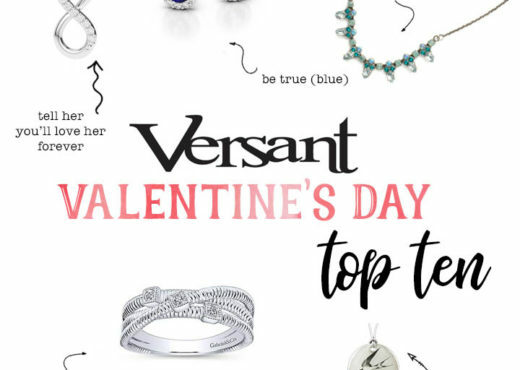 Stop by Versant to see all of these beautiful new charms in person.